Welcome to my backpacking Palenque Guide! 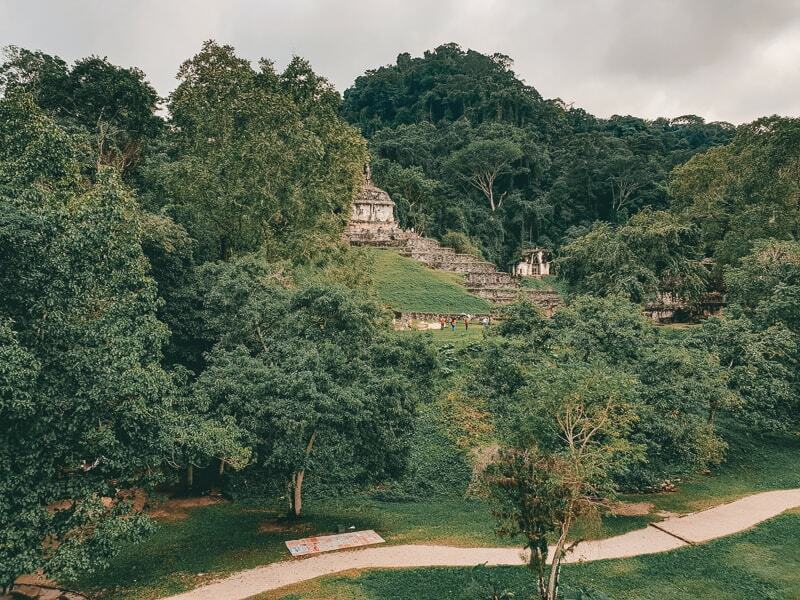 Palenque isn’t the largest place in the world, but this guide should help you get to grips with getting there, what to do there and how to move onwards! I’ve also included food options, accommodation options and a budget guide. Let’s get to it! Palenque is a town in the Chiapas state of Mexico. 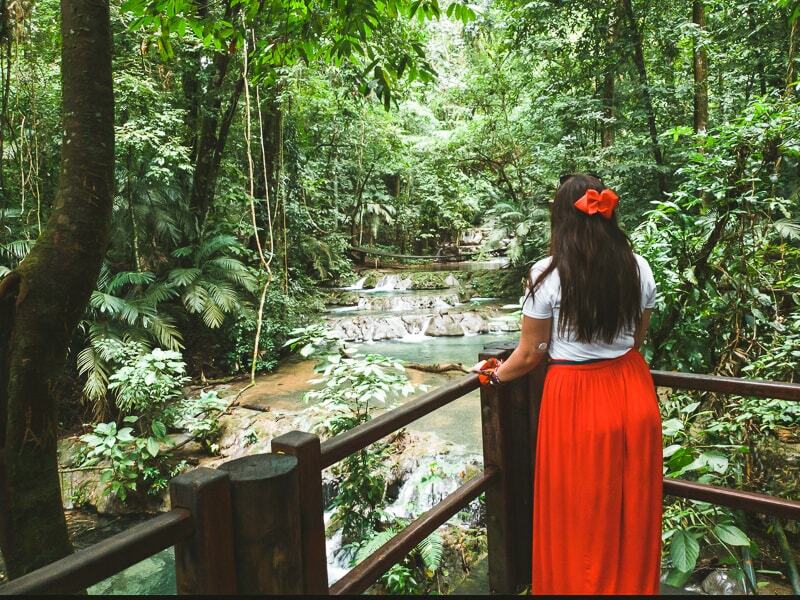 It’s famous fo the Palenque Ruin which are Mayan ruins and temples, and fantastic waterfalls in close proximity. It’s a very cheap place to visit, eat and stay in, for perfect for everyone! When is the best time to visit Palenque, Mexico? Palenque generally has quite a warm climate, but it has a dry and wet season. The lowest chance of rain is during the months of February, March and April, but if you want the hottest weather, then May, June, July are your best bet. Bradley and I visited in January, and we had one day of non-stop rain, and one day of pure sunshine. Unfortunately, the rainy day was when we booked a tour to visit the waterfalls, which was a bit annoying, but we still made a good day of it! When it’s warm, the temperatures in January hit around 28 degrees Celsius. 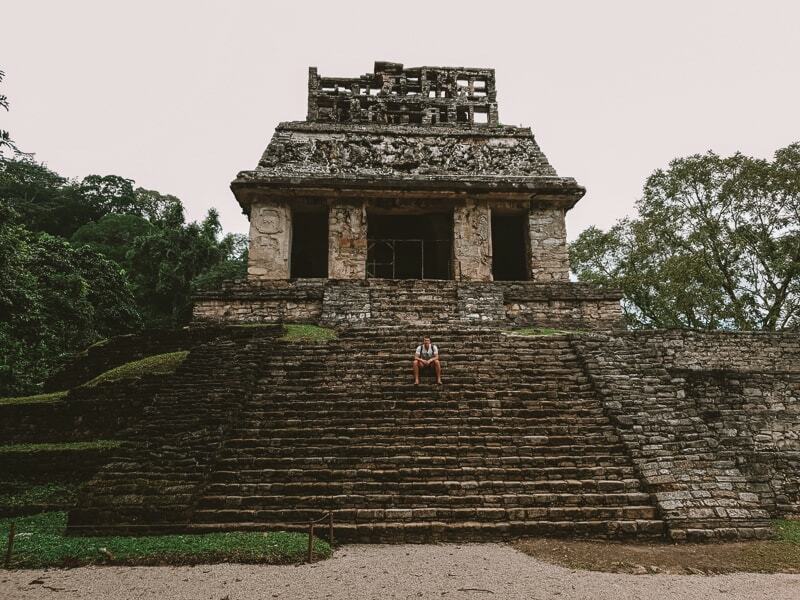 How long should I stay in Palenque, Mexico? Bradley and I had two full days (we arrived early from an overnight bus from Tulum) and two nights which I thought was a nice amount of time. However, you could easily spend another night or two here, so I’d say the optimum length of time to stay is 3 nights. When it comes to getting to Palenque Mexico, you have a variety of options. Bus: if you are coming from the Cancun/Tulum direction of Quintana Roo, then you can get an overnight bus with ADO. There are a variety of bus options and they range in different prices. Basically the cheapest will give you the standard bus with no recline on your seats, which means no sleep on the journey. You can pay extra for “business” class, which we did, and your seat reclines. Not fully though. But the buses are very clean and you get a drink on board, free WiFi, TV and plug sockets. There are also two very clean toilets on board. It cost us around £28 for the journey and it took around 10 hours. You can book your tickets in Tulum, both at the bus station at the Tulum Ruins, or at the bus station in the main centre. OR, you can book in Cancun too. If you book in advance you get a slight discount, and any discounts that you see online on the website, only apply to residents of Mexico, and you need a Mexican credit card to book. Air: You can also get to Palenque via flight thanks to the airport that is now in the area. You can fly from Cancun, or Mexico City if you’re in the other direction. Flights vary at around £70-100, so it depends on whether it’s within your budget. But it’s a quick flight and a fuss free way to get to Palenque. Car: Renting a car in Mexico is super affordable and convenient. 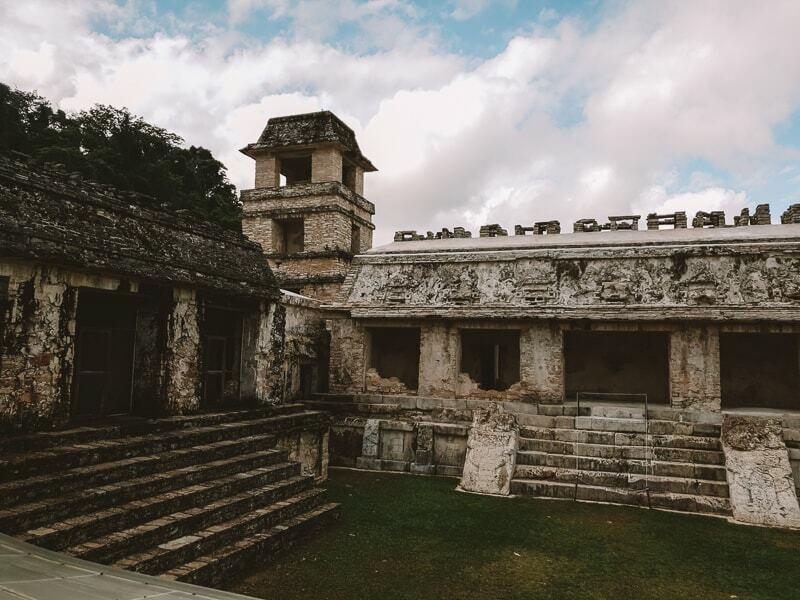 If you’ve landed in Cancun, you’ll probably want to rent a car to explore the coast of Mexico, but why not make a roadtrip a little further and head to Palenque. You can map out an epic road trip! 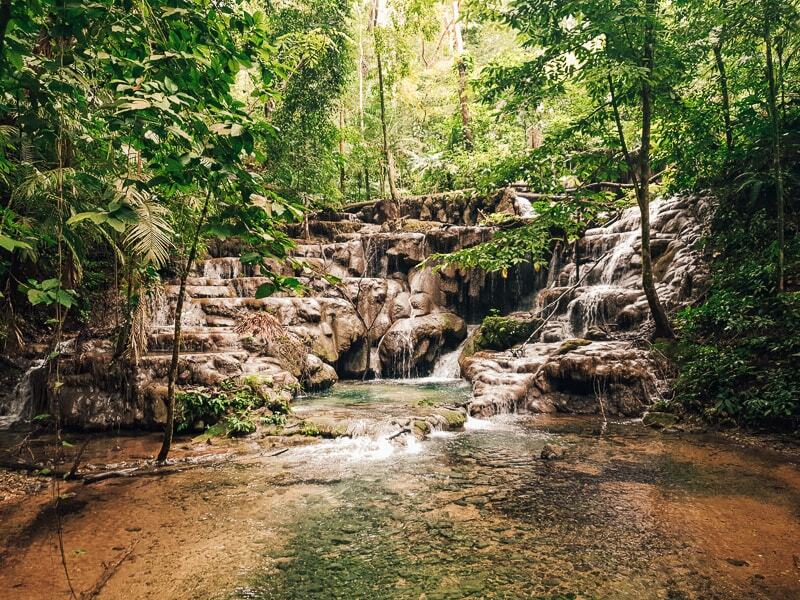 Palenque actually has some great things to do. I done my research before I visited, and then we talk to lots of tour operators once we arrived to find the top things to do in Palenque. So, enjoy! I am going to go into much more detail on this in the next section, but the main reason most people visit Palenque is to see the Palenque Ruins. It’s one of the great Mayan cities and the ruins are truly spectacular. It’s super easy to get there by yourself, and it’s cheap...more on that in a little bit. So there are around 3 waterfalls in Palenque that are worth seeing. All of which you can visit on your own. But actually, Bradley and I priced up the cost of going on our own, with entrance fees and it turned out the tour cost about £2 more so it was worth just booking that for convenience. So, the waterfall tour takes you to 2 of the waterfalls, and they are both worth seeing. Tours typically cost around 300 pesos (£12ish) I wouldn’t pay any more than that. The tour picks you up from your hotel in Palenque at around 12pm and you return around 7pm. The price also includes your entrance fees to the waterfalls, but not lunch, but it’s super cheap to buy lunch! You can swim if you wish! This is a powerful waterfall and you can walk around and behind it via a little path where you will definitely get wet. You can swim in this waterfall at your own risk, but you can take a life jacket. It was raining when we were there, so if it was dry, we would have 100% went swimming under the waterfall. You get to spend around 40 minutes here, which is enough to take a stroll and have a swim and of course take some photos! It’s back into your little mini bus and onto the next waterfall. The next waterfall is located a further hour away, but it’s OH SO WORTH IT. 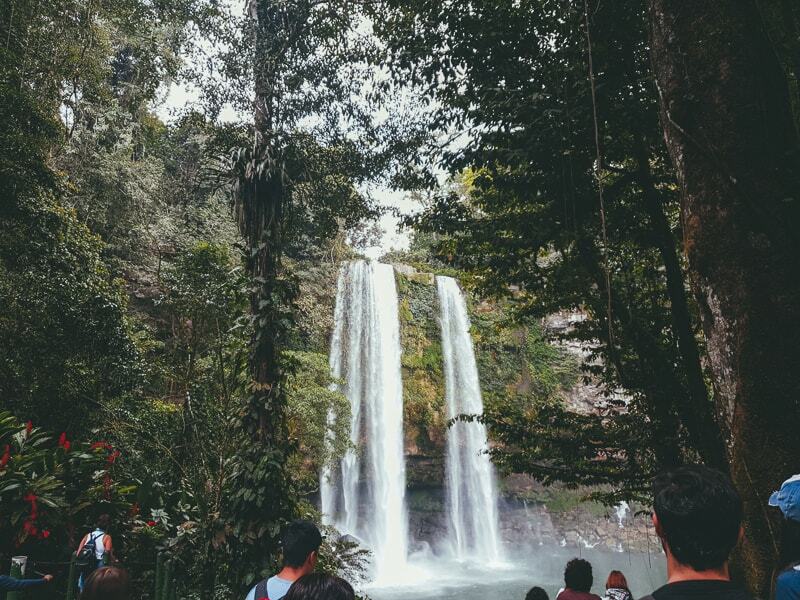 The second waterfall is called Agua Azul and it’s truly spectacular. Bradley and I have seen A LOT of waterfalls over the year, so it really does take quite a lot to impress us. My favourite waterfalls have been in Laos, and this waterfall is up there with their greatness. It’s layers and layers of pure blue pools and waterfalls, and there is a whole trail you can walk up to different viewing platforms, and actual swimming pools cordoned off for swimming. There are even changing areas too. IT WAS STILL RAINING when we were there, and I don’t mean light rain, I mean constant heavy rain, so swimming in the falls did not seem worth it. No one did actually, but if you get here on a sunny day, then you’re going to have an even better time. The waterfalls are beautiful, and you cannot fly a drone there, (FYI). You get two hours to explore the waterfalls, which is fine if it’s not raining, but for Brad and I, we had to find a way to pass the time. We walked to the top of the waterfall, despite the rain, and avoided slipping narrowly. We then decided alcohol was needed, so we stopped at a little cafe that was serving 5 empanadas for 20 pesos (less than £1 for 5), so we had 10 and a vodka and orange. The little restaurant was super cheap, and right next to the falls, so a perfect view. There are actually well over 30 cafes and restaurants in the falls, alongside a lot of souvenir shops, so you won’t go hungry, and it’s not expensive at all. After all this, it’s time to head back in the van and head home. Top tip: take anti-travel sickness tablets, which are easy to get in any pharmacy. The roads to and from the waterfalls are quite windy, so it can feel a little sickening. 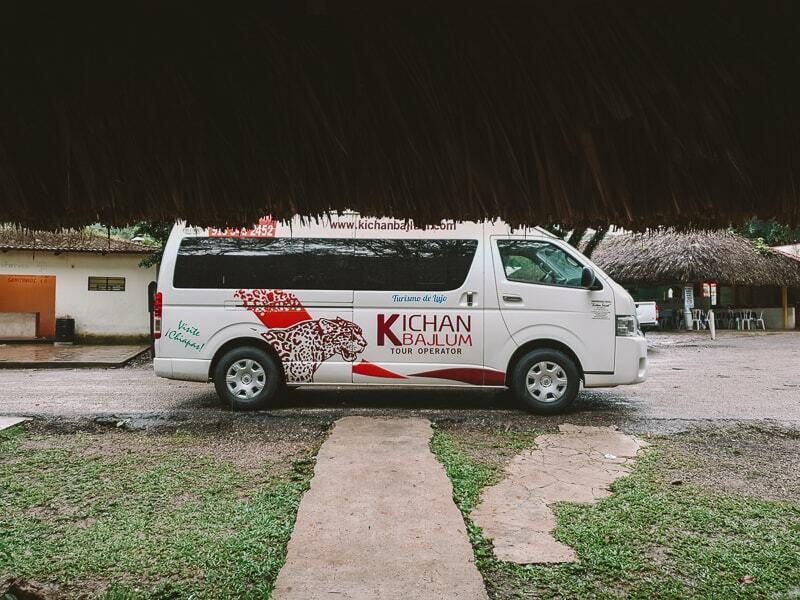 If you would like us to recommend a tour company, I can recommend Kichan Bajum as that’s who we used and it cost 300 peso per person. There is another company which is actually a little cheaper for 260 pesos, so it’s up to you. I’ve taken a picture of all their tour prices to make things easier and give you an idea of what to expect as of 2019. It’s the well known backpacker colonial town in Mexico, and it’s well worth a trip if you’ve got time. Lots of people go there and spend a few days, but if you’re on a backpacking timeline, then you can take a day trip from Palenque and explore! It’s a long day, leaving at 7am and returning at 10pm, but at least you get your moneys worth. The Eco Park is a conservation park that rescues flora and fauna that has been destroyed or is in danger. It also includes birds and butterflies that have found shelter here too. Personally we didn’t go here, simply because we didn’t have enough time. But we were in a van with people who said we should go! It’s on the same route to the ruins, so you could go via that. If you’ve just come from the expensive areas of Tulum and Cancun, then the prices of food in Palenque will be surprising to you! Brad and I dined like kings and queens for a stupidly cheap price, and margaritas are both delicious and cheap- just saying! 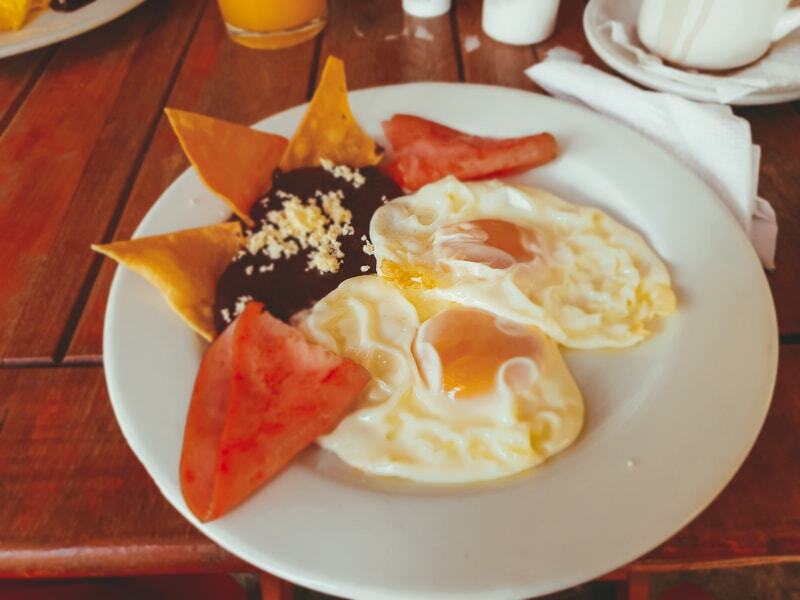 We recommend “Ha-Ki” which is in the main little square and does excellent food and breakfast for a great price. It’s also highly rated on tripadvisor. Okay, the best things to do in Palenque is visiting the AMAZING Mayan ruins. I was super excited about seeing these. Actually, when I was planning a way “out” of Mexico into Guatemala, I thought I had to go through Belize, but then I discovered I could go via Palenque, which lead me to discover the amazing Palenque ruins. 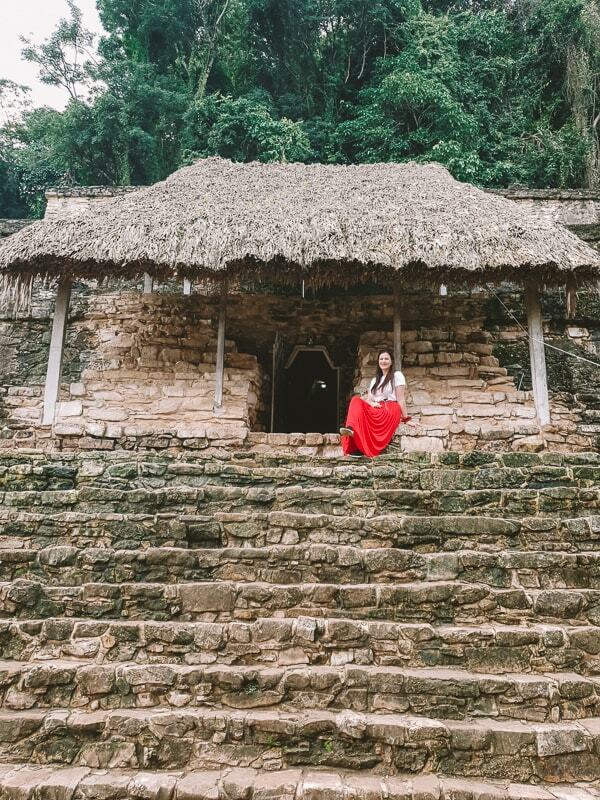 This information is all about seeing the Palenque ruins on your own, without booking a tour. You can book a tour and combine it with seeing the waterfalls if you’ve only got one day. But otherwise it’s super easy to do it on your own. Step 1: Head to the ADO bus station in search of a collectivo to the ruins. You’ll probably find one on your way, but heading in that direction is a good start. Step 2: Know the price to the ruins. It takes about 20 minutes to get to the ruins and it should cost 20 pesos- maybe 25, depends on the guy and the amount of people on the collectivo. Step 3: Get off at the ruins. There will be no issues here, they will drop you off at the entrance to buy tickets. Step 4: Buy your tickets, it’s 75 pesos into the ruins as of Jan 2019. There is a little sign that says you pay an extra 45 pesos for camera use. I actually went to pay and they guy said no, they mean big professional camera for commercial use. So small cameras are fine! Step 5: EXPLOREEEEEE. 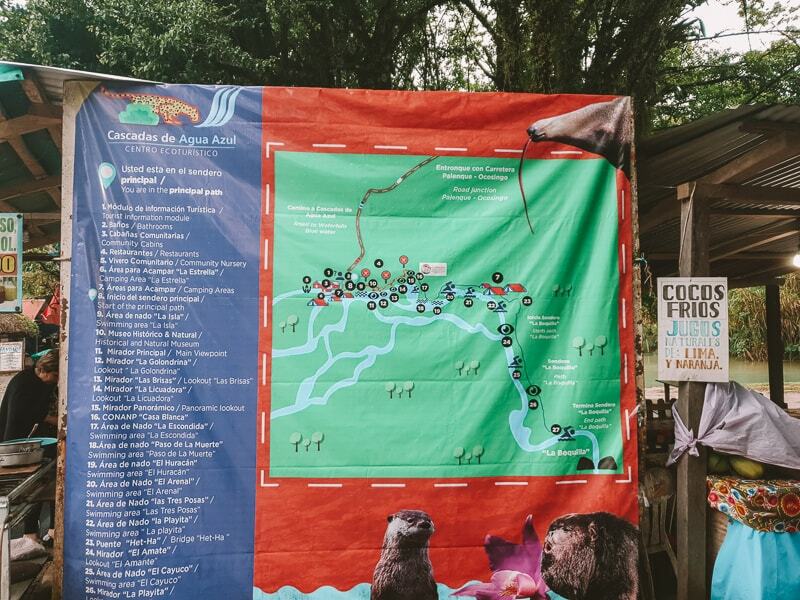 There is a map on your way into the park, and you’ll have quite a few people offering you bug spray (a good idea to bring it with you), and a guide. If you want a guide, get a guide. We did not want a guide and all the information in the park is in English, which makes it easier to understand what’s been going on. There are opportunities to walk up on the ruins (some of them) and get pretty cool pictures. But, I would recommend simply wandering into the jungle and discovering some of the ruins that have just overgrown that’s pretty cool. Lots of people are selling souvenirs, so if you want something, then haggle. On your way out, go to the exit via the waterfall. The waterfall is beautiful, and some people actually miss it out because they do a smaller loop of the ruins. The route out of the park via the waterfalls is a little longer, but it’s worth it, and it will take you right out to the stop needed to get your collectivo back again! Just wait on the side of the road and hop in one that says “Centro”, or someone shouting “Centro?!”. There is no one to buy food “inside” so bring a sandwich with you. There is a massive supermarket just a few minutes walk from the ADO bus station that you can get cheap food and drink to bring in with you. They will charge you money to take photos with a tripod...so maybe avoid it unless you want to pay quite a bit! Sunscreen is needed- it’s warm out there! Don’t be alarmed by the howler monkeys, they sound like dinosaurs and sound closer than they actually are. So getting to and from the ruins is easy and cheap as in the entrance fee, so it’s an easy activity to do on your own without an organised tour. But, up to you! 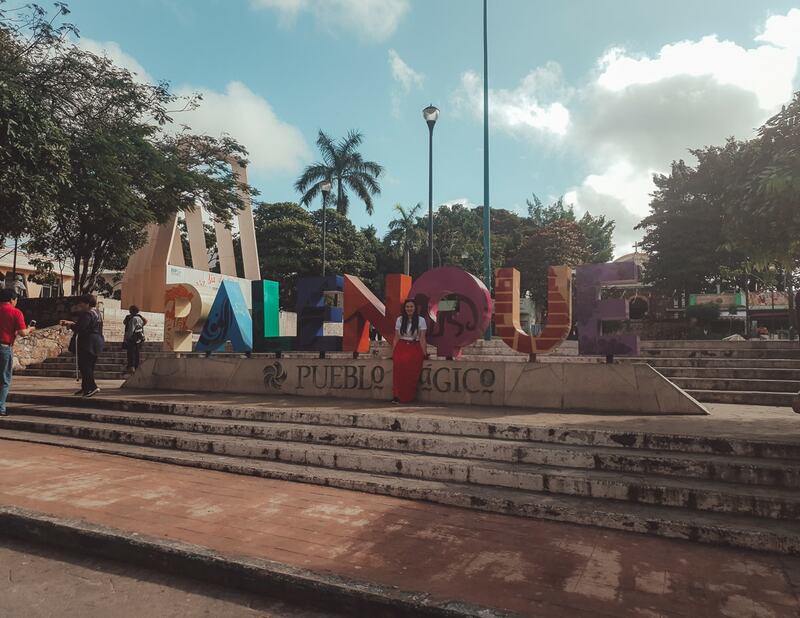 Palenque has a range of hotels to suit a variety of budgets, but actually everything is well priced in Palenque, so you can get great accommodation for a great price. I am going to recommend Hotel Mision, as that’s where Bradley and I stayed for two nights. It’s like a big resort with acres of beautiful green land, and you feel like you’re amongst the jungle. Rooms are clean, colourful and the bathrooms have hot water. There is a fabulous and big swimming pool, perfect for cooling down after visiting the ruins. And there is a fantastic on-site spa. But not your typical spa, it’s a spa experience, so they have an outdoor mud bath, area for yoga, reflexology and much more. It’s truly amazing. I really enjoyed our stay here and it’s an excellent price for what you get in return. The breakfast is also delicious and sets you up perfectly for the day! WiFi is strong enough to browse, but not download, but then again, Palenque in general struggles with it’s strong WiFi. You can book your stay here. Or, you can check other hotels in Palenque here. As noted in the top things to do section, my favourite restaurant was “Ha-Ki” for it’s great setting, great prices and delicious food. We had breakfast and dinner here once. I would check out Tripadvisor for the best deals, or simply wander around. The Italian Coffee Company does AMAZING coffee and has decent WiFi if you want to connect. And they do really do paninis too. There are lots of street food stalls too and lots of places offer the traditional menu del dia (menu of the day) which is usually 2-3 courses with a drink for a set price. 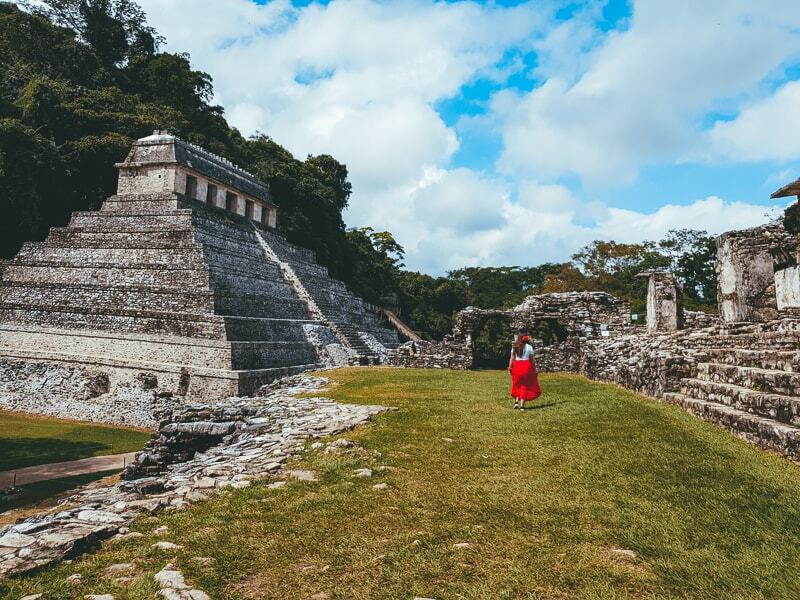 After you’ve finished visiting wonderful Palenque, you may find yourself heading towards Mexico city. If so, this is where I leave you, as I haven’t been to Mexico City, but you will find lots of transfers. Same for Cancun and Tulum! If you are wanting to cross from Palenque to Guatemala, then you’ll be getting the bus from Palenque to Flores, Guatemala. Before I booked this journey and researched online, the internet made it sound really complicated. Now, you can do this journey on your own, via getting a shuttle to one place, then a taxi to the border, and then the same when you cross the border etc. I’ve been travelling for a while now, and I can’t be bothered with all that hassle for the sake of saving a bit of money. So, I wanted a transfer, and that’s what I found. Every tour agency (of which there is lots) do a transfer to Flores Guatemala. The price is 600 pesos per person (so about £24). The actually really pleasant journey goes like this. You get picked up from your hotel/hostel in Palenque at 9am. You drive to the border, and on the way you’ll stop at a lovely and modern coffee shop for a quick coffee (it was delicious and takes card) and a pee. Or some food if you haven’t eaten yet! Next, you’ll stop at the Mexican border and you will say Goodbye to Freddie (he was our lovely driver). This takes around 2.5 hours. The mexican border is a PISSTAKE. There is ONE person operating and stamping passports, which just means it takes ages. Longest border control I’ve ever been at. We waited almost an hour for 5 people. YUP. Anyway, Freddie will pass you to Jay, who will be passing his passengers from Flores to Freddie. So it works out well. You simply walk with Jay to Guatemala border control (which is tiny and I walked right past it), and it takes about 30 seconds for a lovely man to stamp you into Guatemala. Then you hop in your very modern and comfortable (was a pleasant surprise) collectivo onwards to Flores. This takes around 4 hours. You will arrive in Flores around 3-4pm, just in time to catch an amazing sunset! But wait...what about that Mexican border exit tax?! Ah yes, that. Well, I didn’t know I had to pay a tax, so I didn’t go to a bank beforehand, and no one at Cancun airport mentioned it, or gave me the form that the immigration man was waving at me. He kept asking “do you have proof you’ve paid tax”, I said no, I have not paid tax, because I didn’t know about tax. Then he says, immigration should have given you this “they didn’t”. He flustered around for a bit, (the tax was about £30 each which we did not have on us). And then he asked, “Are you coming back to Mexico?”. I said yes, because we were, and he just stamped the passports and let us through. So, I don’t really know what happened there. But, there is a tax, and you are supposed to go to a bank in Mexico and pay it, and then bring a receipt for proof. If you are only in the area for 7 days or less, it’s FREE. No tax. Brad and I were there for 7 nights, so maybe that’s why we got away with it!? More than 7 days> go to bank and ask them about tax to pay. So, do I recommend getting the shuttle from Palenque to Flores, Guatemala? HELL YES I DO. It was comfortable, it was safe, it was convenient, i got nice coffee, a friendly driver and there was no complications. So there you have it, my backpacking Palenque travel guide. 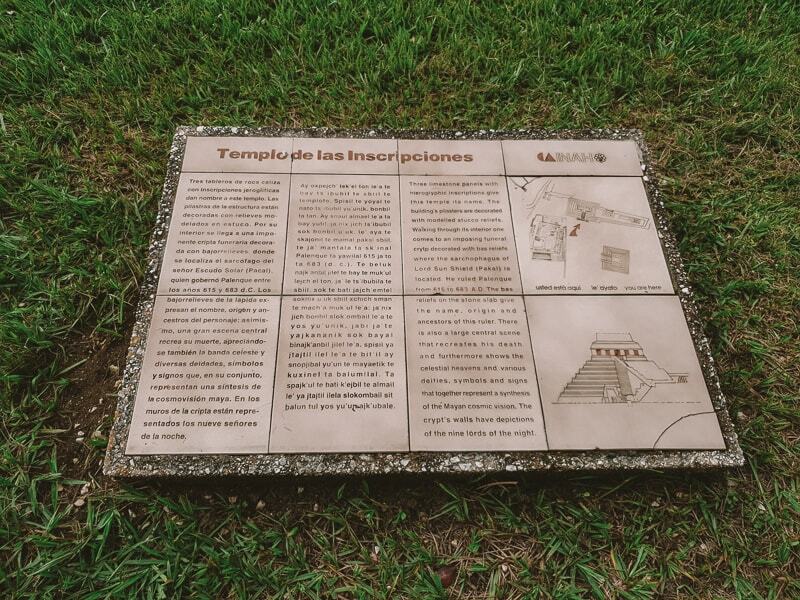 I hope you’ve found this useful and you’ve got all you need to know to navigate Palenque and have a great time. What I really liked about Palenque is that it felt authentic to me, and I felt safe all the time. People are friendly and there are a lot of police about...which is standard Mexico. But, Palenque is somewhere I highly recommend and one of my highlights in Mexico. Thank you for reading and happy travels. If you have any more questions, comment below and I’ll get back to you! 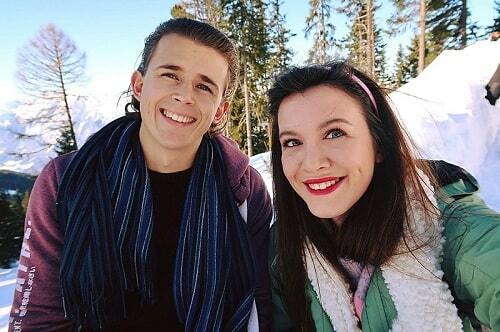 Don’t forget to follow us on Instagram to see our recent travel pictures! Want Great Tours In Palenque?